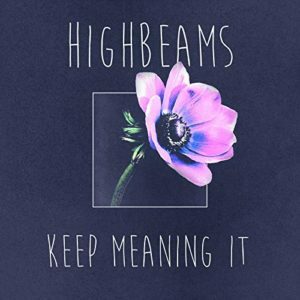 An acoustic guitar sweeping jingle jangle begins “You Can Leave Me,” the opener on the Highbeams’ Keep Meaning It. I like how this one quickly gets going into a smart little mover, wonderfully layered, sung and played. Ian Pendlington’s simple and pretty piano lays the bed for the ballad “Someday,” that follows and before too long it too gets going with sweet harmonies and Cajon-led beat. That Cajon, played by Ian Pendlington actually, starts us into what might be the best early tune for me here, “Mess We Made.” The piano, acoustic guitars and the sweet voices of Adam Pendlington and Stephen Quinn (guitarist and bassists both here as well) fill out this great tune. Those harmonies are present once again, almost to a Simon & Garfunkel expertise, on another great song, “Talking to Myself,” a piano and guitar slightly sardonic read. “Either Way” gets going in a way very few here do, snapping along, truly Americana poppy and just this side of almost too noisy in the production…its wonderful cacophony. And “Window, f. Jenny and Sky,” the song that ends the album, is a back and forth acoustic dripping sorry-for-myself tune. Again the harmonies are just too perfect really and we go out nice and soft with Jenny and Sky lending their female vocal harmonies into the mix to end Keep Meaning It truly like the Highbeams mean to…perfectly.